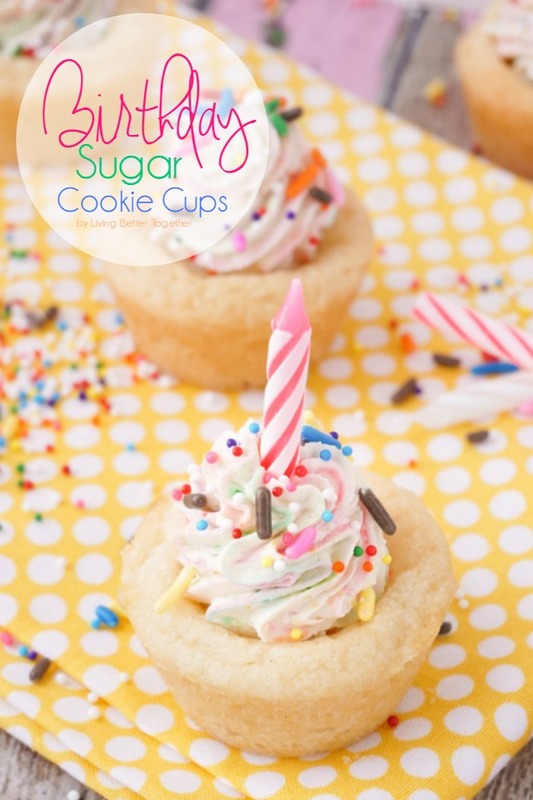 These Birthday Sugar Cookie Cups are so simple to make and the perfect addition to your party! Plus they are made by my fabulous blogging bestie Rebecca! I mean, just look at that picture below! Hey Nerds! I’m Rebecca from Living Better Together and I’m so excited to be celebrating Birthday Month with you here at The Love Nerds! I blog about the same things Maggie blogs about: food, family, marriage, money, and travel with a touch of geek. So I hope you’ll love me as much as you love her and I’d love for you to stop by and connect with me on Instagram or with my Newsletter! Now that we’ve met, it’s time to get this party started! I’m a huge lover of birthdays, okay I’m a huge lover of any event that allows me to make and eat something sweet. I think we need more events on Monday mornings, what do you think? And I’m also a bit addicted to sprinkles, I’ll pretty much pop them on anything if I get a chance! In December, I made these Birthday Cake Pudding Cookies to celebrate my own birthday, but today I wanted to so something a little easier. These Birthday Cookie Cups are super easy and you don’t need to be a baker to make them. They’re perfect for a last minute party treat or even a fun movie night snack. After all, you don’t need a birthday to eat sprinkles! The sweet sugar cookies are filled with a light and fluffy stabilized whipped cream loaded with warm vanilla flavor! Seriously though, what’s not to love!? Once cooled gently remove from pan. If found that the easiest way to do this without breaking the cups was to gently press on the edges and spin them and then simply slide them up and out. Add heavy cream, confectioners' sugar, and vanilla pudding mix to a stand mixer fitted with a whisk attachment and whip until light and fluffy, about 2 minutes. Scrape down the sides as needed. Once you're done whipping, gently fold in a tbsp of nonpareilles. Pipe filling into cooled cookie cups and sprinkle with more sprinkles. Thanks so much for having me, girl! Hope you have a month full of celebrations!